I was in my French class, 2nd period, at West Bloomfield High School. I think we were going over a quiz that we had just received back. I wasn’t the best at French, so the teacher was probably going over a lot of my mistakes. And in one moment, nothing else mattered for the rest of the school day and school week. 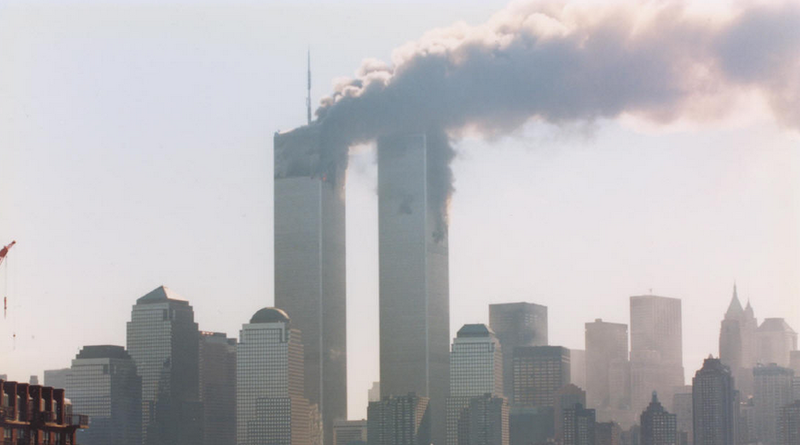 The principal came over the loud speaker, saying something similar to, “There’s been a plane crash at the World Trade Center.” To be honest, I didn’t readily identify the World Trade Center so I didn’t really realize the extent of these happenings. The principal then said she would keep us updated on the situation, but soon, the lunch bell sounded and the halls and cafeteria filled up quickly. They set up about 3 TV’s in the cafeteria, and as more and more information/pictures were broadcasted, a blanket of shock and sadness struck the cafeteria. I can remember the feeling that came over me because the next few hours were so powerful that I can recapture today how I exactly felt. I wanted to go home. I wanted to go home and hug my parents. I wanted to go home to find out if the people we knew in NY were okay. In a nutshell, that moment changed and opened my perspective. Here’s a poem I wrote in the 10th grade after 9/11: My prayers go out to the families of the victims that died that tragic day. the exact way I started every day. our Nation would suffer a vast low blow. thousands dead before the clock hit 11:15. Well planned, well executed, well trained. How do you hijack 4 planes is insane. to the families hurting, we can’t ignore. without much warning, there was no where to hide. now, stories of rubble is all you see. where few have survived, and thousands still lay. and prove again, that America is still best.